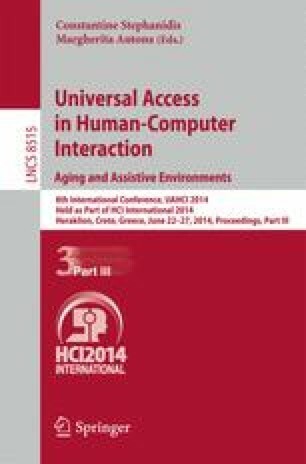 We have developed a tablet computer game app for low vision users that can be used to introduce a platform for gaming, internet and visual rehabilitation to older users who have not had prior experience with information communication technology (ICT). Our target user group is people diagnosed with Age Related Macular Degeneration (AMD). The primary goal of the app is to present a fun and engaging means for participants to engage with Information Communication Technology (ICT). A long-term goal of the project is to build a platform to gather data on current and on-going visual function by creating a suite of games that could generate sufficient regular visual engagement to enable perceptual learning in the preserved peripheral retina that is spared in AMD. The inclusive design process took into consideration the perceptual and cognitive constraints of the user group in. The ‘Tapology©’ app was formally launched at a large computer games festival where we gathered data from a range of users to inform the development of the gameplay. The initial results and feedback inform the ultimate goal of creating a suite of applications that have a wide social and geographic reach to promote and inform e-inclusion and e-health.